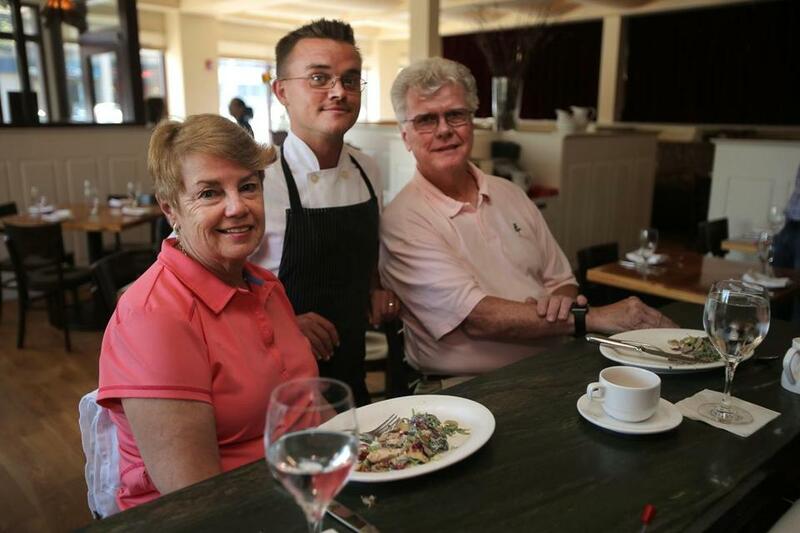 Ted O’Neill and Mary Ellen Neylon with Lumiere owner/chef Jordan Bailey. You have a favorite restaurant. The staff greets you by name. You’re seated at a preferred table. That specialty cocktail you like? It’s en route before you’ve ordered. Complimentary small dishes appear. Ah, the joys of being a regular. While others may dash to dine at new or buzzworthy spots, you are among those who go to the same restaurant again and again and again and again. Like Mike and Leslie Caruso. They’ve supped at Taberna de Haro in Brookline almost every Saturday for 14 years. James Kreis has popped into Loyal Nine in East Cambridge for coffee, breakfast, or drinks more than 100 times since it opened last year. Ted O’Neill and Mary Ellen Neylon, husband and wife, have dined at Lumiere in West Newton about 700 times in the past 10 years. Yes, you read that right: 700 times. Catering to frequent visitors is good business. They require less handholding and spend more money than new guests, according to a 2002 study by the Journal of Services Marketing. Benjamin Lawrence, of Cornell University’s Food & Beverage Management program, points out that restaurants have taken a cue from hotels on pampering repeat guests. He notes OpenTable helps analyze a customer’s purchase behavior and dining preferences to prepare for the next visit. Regulars travel the menu, are open to specials, and don’t hesitate to share opinions about the meals. “I enjoy feeding Ryn because I can trust her,” says Mei. “She’ll say, ‘I think there was too much salt in that dish.’ Ryn understands the vision of our restaurant.” These customers also care about how staff is treated. “It’s nice to know we’re frequenting a place that seems like a nice place to work,” says Bollinger. For some regulars, their favorite spot is already a part of their neighborhood, or at least nearby. Kreis lives around the corner from Loyal Nine, but notes: “If it was a mile away, I would walk there.” The Carusos live a mile and a half from Taberna de Haro. Miake-Lye visits Moonshine 152 from her Roxbury home. Over time, these regulars become part of the restaurant family. “At this point, it’s friendship,” Mei says about her relationship with Miake-Lye. Bollinger is Facebook friends with some Highland Kitchen staff. O’Neill and Neylon exchange chatty e-mails with chef Michael Leviton, who earlier this year handed Lumiere’s ownership over to chef Jordan Bailey. O’Neill and Neylon have long been fans of Bailey, previously Lumiere’s chef de cuisine. Hansen says any guest can enjoy perks if they emulate regulars. “They are gracious and kind,” she says. “You want to go the extra mile for the customer who is polite.” It might be a glass of wine sent your way, or a dessert you didn’t order. The staff will address you by name. Then you will know you are a regular. Peggy Hernandez can be reached at mphernan1@gmail.com. Follow her on Twitter @Peggy_Hernandez.